There is a Jimmy robot, who wants to look as tough as the robots from the shop on the other side of the street. But they refuse to accept him, so he decides to prove them wrong. Are you ready to help Jimmy to join a group of tough robots? They don't want to accept him because of his look and size. But considering that Jimmy is a robot, he can get upgrades. That's what we are going to do in this game. 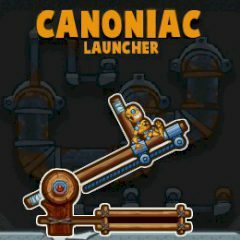 Launch him with a cannon and get enough money on upgrading his armor and weapons.